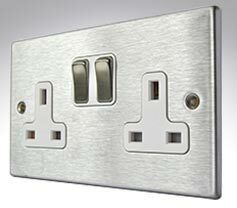 The slim and stylish Hamilton Hartland range of switches and sockets will add style to any home or office. 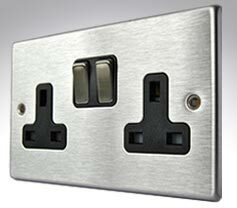 This beautifully crafted range of low profile switches and sockets adds that special finishing touch to any interior. Hamilton Hartland is available in various quality finishes with black or white insert options. These sleek Hamilton Hartland Low Profile fittings are manufactured in the UK with a 5mm profile. Hamilton Hartland 5mm low profile switches and sockets in satin stainless steel with black inserts. Hamilton Hartland 5mm low profile switches and sockets in satin stainless steel with white inserts. 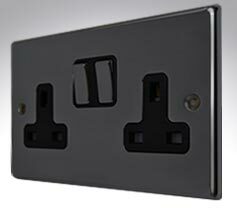 Hamilton Hartland 5mm low profile switches and sockets in black nickel with black inserts. 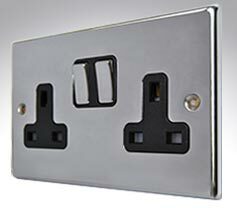 Hamilton Hartland 5mm low profile switches and sockets in polished chrome with black inserts. 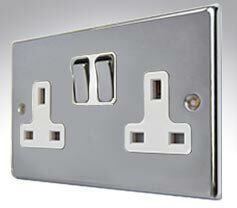 Hamilton Hartland 5mm low profile switches and sockets in polished chrome with white inserts.